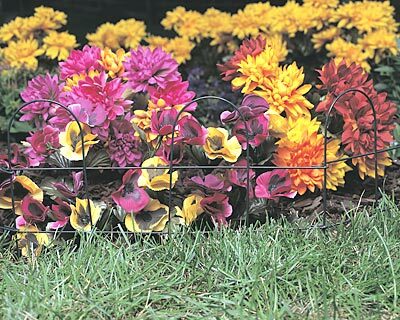 Guard your plants from foot traffic in a clever way with the Panacea Mini Arch Folding Fence. Two arches per section offer visual interest without being distracting, and the 10" height is perfect for protecting your plants. This ten foot long border can separate a small area of plants or define a walkway, and the green color blends with any outdoor scene. The powder coated finish offers durable weather resistance, and the fence installs in minutes. Put the Mini Arch Folding Fence in your yard and enjoy a beautiful garden, season after season. Note: This case pack includes 15 of the Panacea Mini Arch Folding Fences.